Unlike the anti-revisionist movement in many other countries, which emerged from Comintern-era Communist Parties, Norwegian anti-revisionism first developed primarily within radical student groups and among elements in the left-wing social democratic Socialist People’s Party (SF) in the 1960s. The resulting movement that formed in the 1970s was relatively the largest and strongest of that in any developed country. 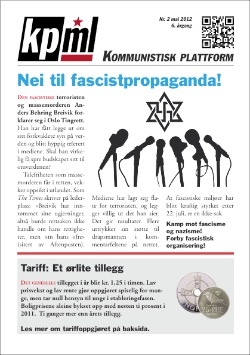 Its principal organization, the Workers’ Communist Party (Marxist-Leninists) of Norway (AKP(m-l)), boasted a membership approaching 5,000, a daily newspaper with a circulation close to 15,000, and the support of many leading artists, writers and intellectuals. It maintained an active electoral presence in the country through its Red Electoral Alliance (RV). The AKP(m-l) was fervently Maoist for much of its early history, looking to the Chinese Communist Party for theoretical-political leadership on many questions. After the AKP dissolved in 2007, Serve the People – Communist League, a minor anti-revisionist organization formed in 1998, claimed to uphold the banner of Maoism in Norway. Part of the reason for the AKP(m-l)’s success was that it united virtually all Norwegian anti-revisionists in a single organization. Only the very small Communist Workers League (KA), formed in 1972 by former members of the Communist Party of Norway (NKP) who had either been expelled from the party or left voluntarily remained outside. 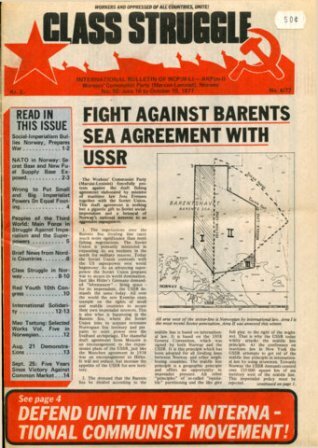 The KA issued several sporadic periodicals, including Red Flag and The Red Worker. It, too, followed the Chinese line, at least until the break between China and Albania, when it took up the Albanian position (the KA dissolved in 2006). In the 1980s, however, Norwegian anti-revisionism began to fracture and decline as a result of the combined effects of Mao’s death, shifts in Chinese foreign and domestic policy, and the public polemics between China and Albania over Maoism and the “theory of three worlds.” While the AKP (m-l) defended the “theory of three worlds,” the KA endorsed the Albanian line as did another group that emerged in this period, the Marxist-Leninist League (MLL). The Marxist-Leninist League (MLL) was a small anti-revisionist group formed in the 1980s by a nucleus of young activists who had left the KA. Like the KA, the MLL was politically aligned with the Party of Labor of Albania. MLL published Arbeideren (The Worker) and ran a bookstore with the same name. The MLL was dissolved by the mid-1980s, but it later re-emerged as the Marxist-Leninist Group Revolution. From the 1990s on, Norwegian Marxist-Leninists were active in the trade union movement, the women’s movement and in anti-war activities around Yugoslavia, Iraq and Afghanistan. The AKP continued to be by far the largest organization, but its membership never matched what it had been in the 1970s. In 2007, the AKP dissolved itself by joining with the Red Electoral Alliance to form a new broader, less-Leninist organization, the Red Party. A small number of former members of the AKP and its student group who were unhappy with this decision, joined with Marxist-Leninist Group Revolution to form Communist Platform in 2008 with the goal of creating a new anti-revisionist communist party. The AKP(m-l) had its origins in the Socialist People’s Party (SF), which was founded as a left-wing split-off from Norway’s social democratic Labor Party in 1961 by members protesting its support for Norway’s NATO-membership. In 1963, as the “New Left” began to develop, the Socialist Youth League (SUF), SF’s youth organization, was formed. In 1969 the SUF broke its ties to the SF and took the name Socialist Youth League (marxist-leninists) (SUF (m-l)) with the goal of creating an anti-revisionist Marxist-Leninist communist party. At the same time Marxist-Leninist Groups (MLG), a party-building organization with members mostly from the SF, was formed. These groups worked together in a process called “Unity–Criticism–Unity”. The Marxist-Leninist Front (MLF), composed chiefly of individuals from the orthodox Norwegian Communist Party (NKP) also took part (although some elements of the latter were not involved in the final process of establishing the Workers’ Communist Party (marxist-leninists) of Norway (AKP(m-l)) in February 1973. The SUF(m-l) was reorganized as the party’s youth organization, Red Youth (RU). 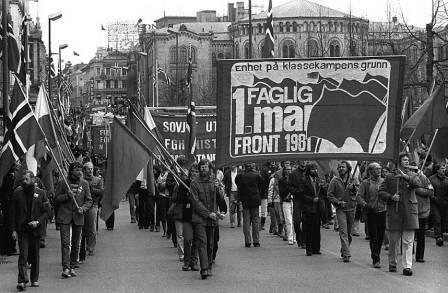 In 1974 the League of Communist Students in Norway (NKS) was established. Within a short time, the AKP(m-l) became the relatively largest and strongest anti-revisionist party in the western world. By the mid-1970s, the Party and its youth groups had several thousand dedicated and active members. 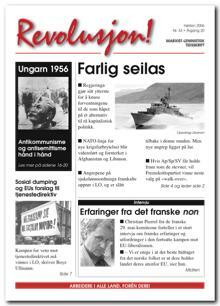 The AKP(m-l) produced a newspaper, Klassekampen (Class Struggle) (launched as a monthly in 1969, published weekly as of 1973, and daily from April 1, 1977). 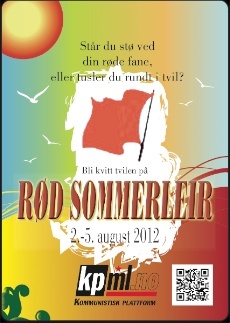 The Party also issued several other publications, the most important being Røde Fane (Red Banner), a theoretical journal. The AKP(m-l) maintained its own publishing house, Oktober, over 20 bookstores around the country, a record company, Mai, and enjoyed the support of several large mass organizations. It had a very strong presence on Norwegian university campuses and in intellectual circles. A 1970s “campaign for the proletarinization of the party” saw many members go into factories. As time went by many of these became active in trade union affairs. The AKP(m-l) participated in national and local elections through the Red Electoral Alliance (RV), although it never became a significant electoral force on a national level. The alliance nevertheless managed to become an important factor in some cities and industrial communities, garnering around 10% of the vote. The RV did, however, secure a seat in the Norwegian Parliament (Stortinget) for the period 1993 to 1997. The RV gradually became independent of the AKP(m-l) and from 1991 on it had its own membership. Nevertheless, party members continued to play an important role in the RV. In its first 10–15 years, the AKP(m-l) rather consistently followed the political line of the Communist Party of China, with the very notable exception of differences on Norway’s possible membership in the European Economic Community (EEC). The Communist Party of China favored European unity against the two superpowers, while the AKP(m-l) was a vital force in the popular movements against EEC membership that in 1972 (and again in 1994) resulted in “No” votes in referendums on the issue. The party upheld “Mao Tsetung Thought,” supported the “theory of three worlds,” and rejected the “Gang of Four” after its fall. The AKP (m-l) took China’s side when public polemics broke out between China and Albania. In the mid 1970s, the AKP(m-l) identified the USSR as a major threat to world peace and to Norway’s independence, and the party devoted considerable resources to mobilizing Norwegians to fight Soviet social-imperialism. As part of this effort, it organized solidarity activities with Solidarnosc in Poland and other activist/social movements in the Soviet Union and Eastern Europe. The AKP(m-l) initially supported Democratic Kampuchea under Pol Pot, including sending a delegation to visit the country which reported back favorably on what it observed. Notwithstanding its prior successes, the AKP(m-l) entered into a difficult period beginning in the 1980s as it lost members and ideological certainty. The decade ended with the party formally breaking with China over the shooting of demonstrators during the Tiananmen Square events. Nevertheless, the party also had its successes in the 80s and for a period thereafter, playing a leading role in both trade union and feminist organizations and campaigns. It also registered important successes in the 1994 EEC referendum and in anti-war struggles regarding Yugoslavia, Iraq and Afghanistan, although membership figures never were close to those of the 1970s. The AKP (the (m-l) having been removed from the party’s name in 1990) dissolved in 2007 by merging with the RV to form a new, broader, less-Leninist organization, the Red Party. Programmatically, this party is revolutionary and anti-capitalist and has communism as its goal. 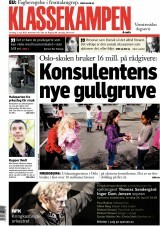 The daily Klassekampen still exists. In 1991 its formal editorial ties to the AKP were ended. It now introduces itself as “the daily of the left”, has an increasing circulation and is reckoned as a high quality leftwing mainstream newspaper. The AKP’s theoretical journal Røde Fane (Red Banner) changed its name to Rødt! (Red!) in 2005, and is now published by the Red party. Starting in 2002 a free monthly newspaper named akp.no was produced. After the Red Party was formed, it changed its name to Rødt nytt (Red news). Promote Friendship with Democratic Kampuchea! Mass Struggle Grows in Norway by the Communist Party (Marxist-Leninist) U.S.A.
Mass Rally Honors Norwegian Party by the Communist Party (Marxist-Leninist) U.S.A.
Norway court railroads five communists by the Communist Party (Marxist-Leninist) U.S.A.
Interview with Norway’s Pal Steigan by the Communist Party (Marxist-Leninist) U.S.A.
Marxist-Leninist Group Revolution is a small anti-revisionist group that was formed in 1987 by former members of Marxist-Leninist League. It identifies itself as Hoxhaist in orientation and is an active member of the International Conference of Marxist-Leninist Parties and Organizations (Unity & Struggle). 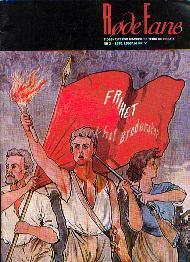 Marxist-Leninist Group Revolution publishes the magazine Revolution!. It currently cooperates with other Marxist-Leninist groups and individuals, mainly some ex-members of the AKP and their student organization NKS, with the aim of forming a new communist party through an initiative that is called Communist Platform (KPml). Communist Platform (KPml) is a political platform and organization formed after the dissolution of the AKP and its decision to merge into the new “broader” Red Party. KPml was created by former members of the AKP and the Party’s student league (NKS), who argued that the new Red Party was not a genuine communist party in the Leninist sense. These forces, together with the Marxist-Leninist Group Revolution, formed the Communist Platform which convened its first annual assembly and elected a leadership in February 2008. Serve the People – Communist League is an anti-revisionist political organization formed in 1998 by members who were expelled from or left the AKP. Its goal is to form a new communist party based on Marxism-Leninism-Maoism. Its youth wing is called the Revolutionary Communist Youth (RKU). The RKU was created after a split from Red Youth [youth wing of the Red Party], which they deemed to be revisionist. Serve the People claims to be the only Maoist organization in Norway. Its base of strength is in the anti-racist youth organization SOS Rasisme.